Oceanic Vision Review 2019: Is Oceanic Vision a Good Hosting? Oceanic Vision is located in Australia but has a worldwide presence. Website hosting is just one aspect of their comprehensive range of internet services. Oceanic Vision is an Australian company providing a wide range of internet services. They’ve been in business for four years and already have hundreds of customers located in fourteen countries across four continents. Their website and support are available in English. Interestingly, considering that Oceanic Vision is an Australian company, their servers are colocated in an American data center. They don’t give much away about the specific center, apart from stating that their servers are “co-located with one of the world’s leading hosting companies” and that they use Global Tier 1 IP network based hosting, Cisco and Juniper Networks for routing technology, dedicated IP address for each server and redundant backbone internet connectivity. They do advertise a 99.9% uptime, although they don’t have a service level agreement. They offer four packages of shared website hosting: Basic, Economy, Business, and Corporate. The Basic package includes 600MB disk space, 5GB data transfer, and 20 email accounts, whilst the Corporate account includes 6GB disk space, 40GB data transfer, and 100 email accounts. All plans come with the choice of Windows or Linux operating system, hardware-based firewalls, and automatic backups for disaster recovery. They state that PHP/MySQL applications are compatible with their operating systems and that they support PHP versions 4 and 5, which unfortunately are a lot slower than version 7.2 supported by many companies nowadays. Whilst they don’t advertise support for advanced coding languages on their hosting feature packages, they do offer website development services, including Ruby on Rails, Angular JS, and so on, so it would surprise me if their hosting packages do not support these languages. They do not advertise a website builder or one-click installer, which suggests their services are more geared towards advanced website owners. Oddly, for a shared hosting company, Oceanic Vision does not provide prices on their website, and you cannot pay and get started online. This is quite unusual and also time-consuming for shared hosting, so unfortunately not the best user experience. I dropped them an email to find out that their prices are broadly in line with local and international competitors if a little on the high side. To get in touch, this company has U.S. and Indian telephone numbers, an email address, and Skype handle. They have three offices in India and a head office in Australia. Given the scale of their company and its services, I am quite surprised that I could not find a knowledge base, FAQs, client zone or live chat on their website. Oceanic Vision has grown significantly during its four years in business. This provider has multiple worldwide offices, clients in four continents, and over 100 employees. Servers located in the U.S.A. Check out Oceanic Vision’s web hosting options today! Wondering how Oceanic Vision stacks up against other Web Hosting companies? 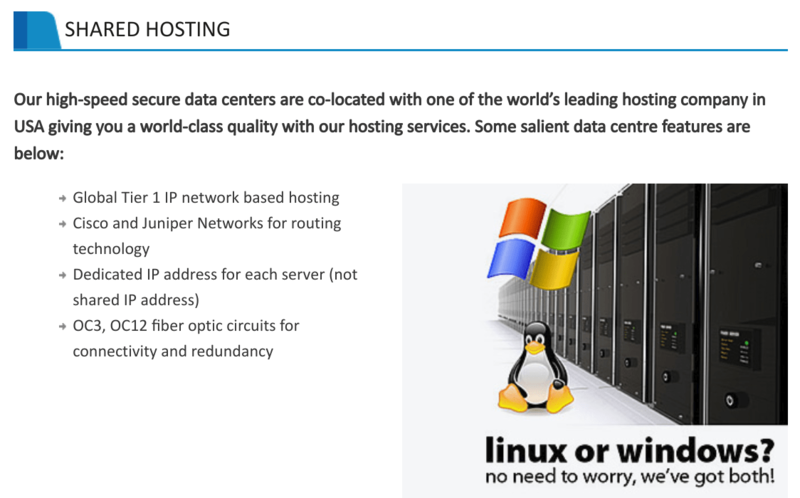 Enter any other Web Hosting company and we will give you a side-by-side comparison.